Taste test: These are the Shaw's version of the kettle chip. 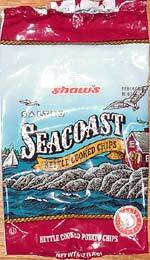 They're good, but they're certainly not as good as Cape Cod kettle chips, which beat out every chip that tries to match them. If you're planning to do any dipping, you might not want to use these  their curled-up, irregular shape makes it tough the get a full dip in. Smell test: Regular oily kettle chip smell. This snack was discovered by Keith and Melissa at Star Market, Stow, Massachusetts.